To add direction and market credibility to their breeding program, Chris Williams sought to develop value-added products for his alpaca fleece. He teamed up with knitwear specialist Frank Spinelli of Spinelli Knitwear, and began manufacturing 100 percent alpaca knitwear under the label of ‘Alpaca Classica'. This stylish range was well received by the Australian market, and was invited to represent the Australian alpaca industry on the catwalk at the International Festival of Camelids in Peru in 1997 and 2000. The Australian-made label was distributed to local, interstate and international markets, being exported to the USA, Italy and Switzerland. 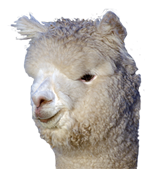 Ambersun Alpacas was acknowledged for its contribution to the fibre industry, when in 2000 it was awarded the ‘Premier's Food and Fibre Award', for Leadership in Fibre Development.